1½ lb. medium carrots, scrubbed, halved lengthwise, tops trimmed to about 1"
Prepare a grill for medium heat. Toast cumin seeds in a dry small skillet over medium heat, tossing often, until fragrant, about 2 minutes. Let cool. Coarsely crush cumin seeds in a mortar and pestle or with the flat side of a chef’s knife. Transfer to a large bowl. Add lemon juice and honey. Whisk in ¼ cup oil until combined, then stir in chile and ginger. Let sit until ready to serve, which will give the chile and ginger time to infuse into the sauce. Toss carrots with remaining 2 Tbsp. oil on a rimmed baking sheet; season with salt. Grill carrots, turning occasionally, until lightly charred in spots and tender, 14–18 minutes. Immediately transfer carrots to bowl with sauce. Toss to coat; season with salt. 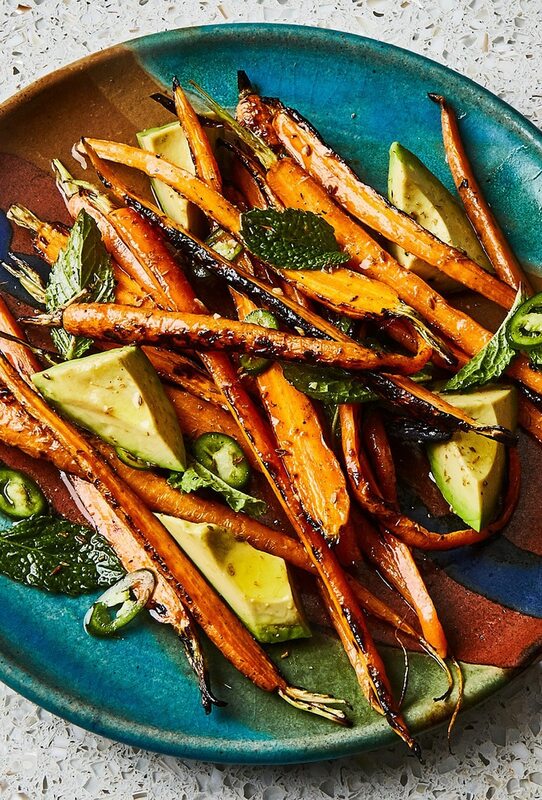 Arrange avocado and carrots on a platter. Spoon any remaining sauce over, then top with mint. Serve carrots warm or at room temperature.